Lima Central Catholic’s Ron Banks tries to break free from Ada’s Daniel Mattson during Saturday night’sgame at Spartan Stadium. See more game photos at LimaScores.com. Lima Central Catholic’s Michael Jay Riepenhoff catches a pass ahead of Ada’s Daniel Mattson during Saturday night’s game at Spartan Stadium. Ada’s Zac Swaney goes up high for a pass during Saturday night’s game against Lima Central Catholic at Spartan Stadium. Lima Central Catholic’s Rossi Moore runs for yardage during Saturday night’s game against Ada at Spartan Stadium. LIMA — There was way too much speed and plenty of quickness. Lima Central Catholic had lots of both on both sides of the ball. 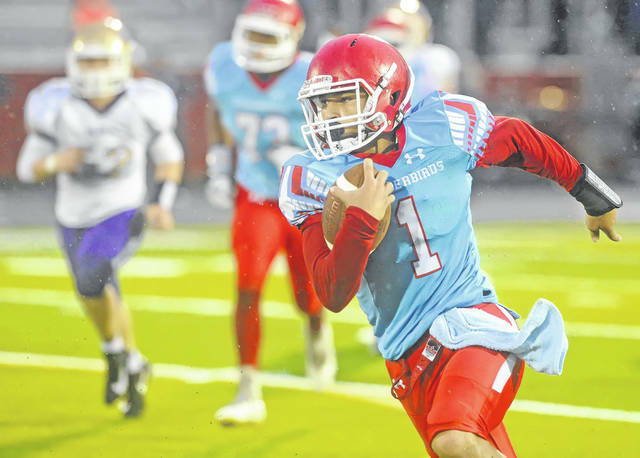 That helped the T-Birds post a 43-20 football victory on a rainy night over Ada on Saturday night at Spartan Stadium. LCC is 3-0, while Ada is 1-2. 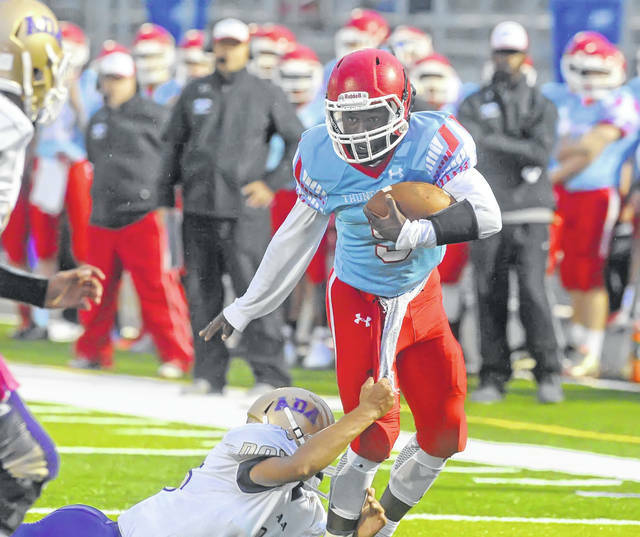 Ron Banks led the LCC ground game with 144 yards on 11 carries. He had TD runs of 1 and 16 yards. Shaun Thomas, who missed most of the second quarter after taking a hard hit, had an 80-yard TD reception and a 75-yard kickoff return for a TD. 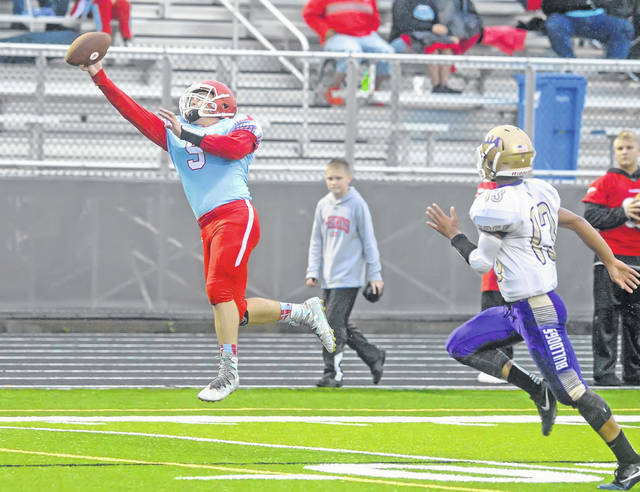 LCC quarterback Nevan Stolly completed 8 of 8 for 171 yards and two TDs. 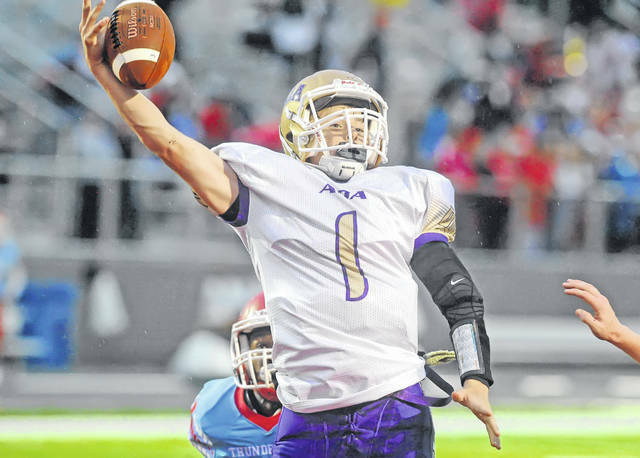 Ada was led on the ground by Landon Blankenship, who had 16 carries for 98 yards. Ada quarterback Brandon Hull completed 6 of 13 for 76 yards and one TD before leaving in the second quarter for good with an apparent injury. LCC led 15-6 after the first quarter, then pulled out to a 36-6 lead at the half. The T-Birds led 43-6 after three quarters. On LCC’s first offensive play, Thomas took a screen pass from Stolly and flew down the left sideline for an 80-yard TD. With the two-point conversion, the T-Birds led 8-0 while many people were still opening up their umbrellas. Ada came back with a 12-play, 77-yard drive to get within 8-6. Ada quarterback Hull hit Zac Swaney with a 13-yard TD pass in the right corner of the end zone for the score. LCC made it 15-6 on a 1-yard TD run by Banks with 2:05 left in the first quarter. That capped off a six-play, 64-yard drive, which included a 35-yard run by Rossi Moore. LCC then went 66 yards in six plays for its next score. Banks swept the left side, bounced off two tacklers and rolled into the end zone for a 16-yard TD. That gave LCC a 22-6 lead with 10:45 before halftime. With Thomas out, Banks continued to roll off tackle for big chunks of yards in the second quarter. Banks got loose for 62 yards to set up the T-Birds’ next score. Banks scored on a 2-yard TD run and to give LCC a 29-6 lead with 5:45 left in the first half. Stolly hit Moore for a 9-yard TD and in the final minute of the half and it was 36-6 T-Birds. By the half, Banks had racked up 142 yards on 10 carries with three TDs. Hull left the game in the second quarter and was replaced by Phillip Coulson, who ran for 35 yards on nine carries. Defensively, LCC linebacker Caleb Heider and end Micah Pearson were causing problems and bogging down the Ada offense. Heider finished with 10 tackles and two sacks. Pearson had eight tackles. “They’re very aggressive players and they have an attack mentality,” Palte said. Thomas returned to action for one play in the second half. Thomas grabbed the second-half kickoff, hit a jet stream and blew past the Bulldogs for a 75-yard TD to give the T-Birds a 43-6 lead. This entry was tagged Ada, limacentralcatholic. Bookmark the permalink.